Southern Summer heat just too unbearable? Spring showers have your kids trapped inside? Not anymore. 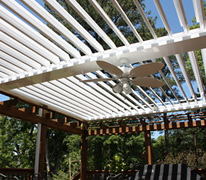 Adjustable Patio Covers offers the Adjustable Pergola. The Adjustable Pergola can protect from sun or rain while providing beauty to any backyard. The pergola comes in many custom designs and will look perfect with your existing backyard decor. Adjustable Patio Covers also offers a complete line of innovative shading solutions including residential and commercial systems. Conveniently located in Metro Atlanta, we will come to your home or business to discuss your options and provide you with a free estimate.